This guy constitutes going a long way down the rabbit hole. The name “Brudiclad, Telchor Engineer” originally appeared on the Future Sight card Sarcomite Myr, a future-shifted card intended as a preview of New Phyrexia. There’s been speculation about whether Brudiclad actually comes from there, but I think we have to assume he does: there are no other worlds where myr are known to exist, and unless the time streams crossed over people with places they don’t live in our time, it’s the safest guess until we’re shown something more definitive. You don’t often see a lot of support for token-based strategies in blue at all, and you don’t see as many in red as in white or green. 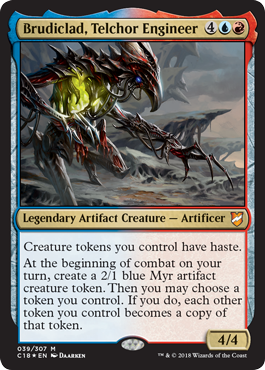 But both red and blue are good with artifacts, and there are plenty of usable artifact tokens ranging from Kaladesh‘s servos and thopters to New Phyrexia‘s golems (another hint of Brudiclad’s origin?). There are a couple of things that make him very dangerous: one is that the other tokens become a copy of the chosen one permanently, meaning he can upgrade a herd of By Gnome Means tokens into 3/3s or greater. The other is that some of blue’s clone effects actually create tokens, meaning that he can upgrade a herd of By Gnome Means tokens into copies of Blightsteel Colossus. The artifact commander some of us have been waiting for. Maybe! Brudiclad is pretty interesting: he makes tokens, and he also allows your tokens to copy the best token on your board for combat. They also have haste, which is pretty awesome. There are definitely ways to make this effect rather imbalanced; Cackling Counterpart makes a token copy, and there are other token-making copy effects. And embalm/eternalize pair well with this. Brudiclad is a cool creature in that he asks you to build around him with a substantial payoff if you oblige; he might be able to work as part of a deck otherwise, but even if he’s just a token generator, an endless stream of Myr tokens is not the worst way to go.